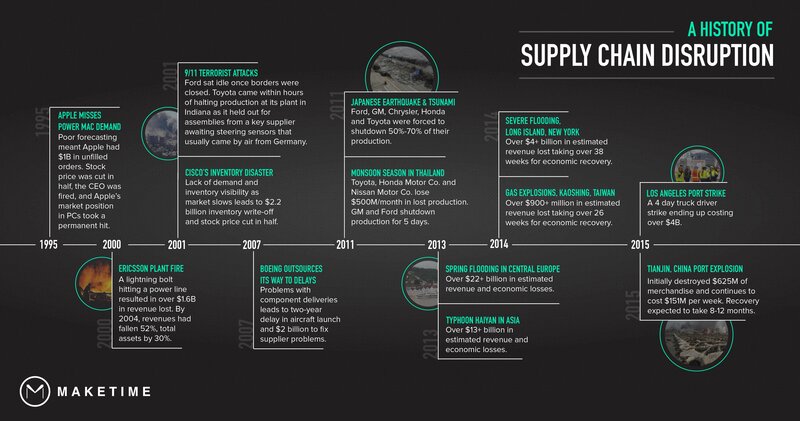 Supply chain disruptions have historically plagued manufacturing - until now. Even the biggest players in manufacturing are not immune to supply chain disruptions. Severe weather, factory fires, political upheaval, labor strikes, even heavy traffic conditions are all supply chain disruptions that have the potential to completely shut down manufacturing operations. For every idle hour of production, millions of dollars are lost. Automotive OEMs in particular lose an estimated $1.25M per minute of down time. To help avoid predictable supply chain disruptions, manufacturers have began taking dramatic measures; suppliers have reported fines up to $10,000 per minute on late deliveries. For low-probability, high-impact supply chain disruptions, however, no manufacturer has yet to put an effective contingency plan in place. The current model of manufacturing is inflexible and unresponsive to change. Just-in-time production delivers incredible cost savings and efficiency gains when operating conditions are ideal. 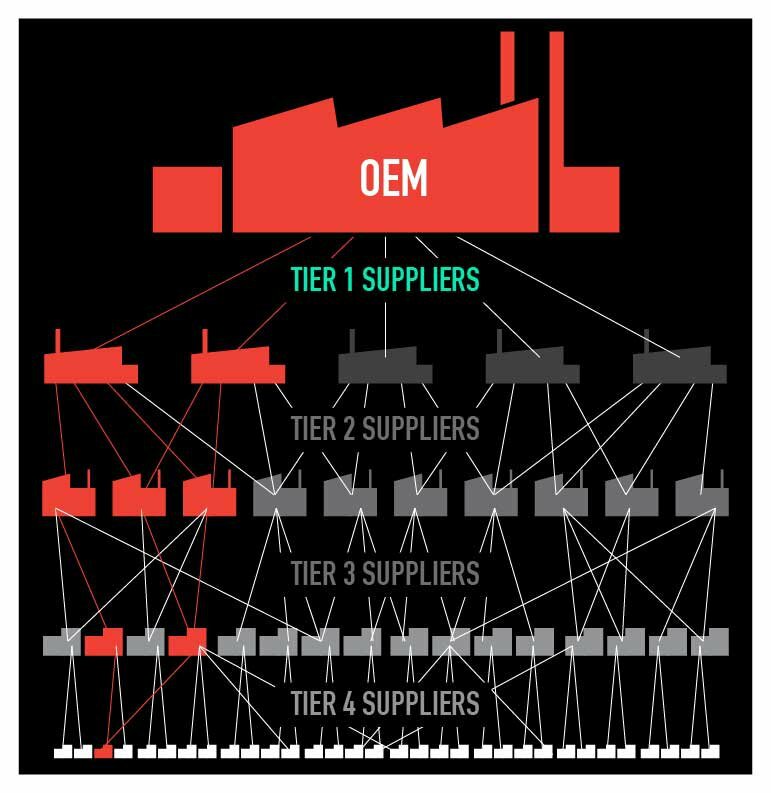 However, when coupled with a linear tier system, these benefits can be lost with just one supplier failure. Deliveries back up, and production can be left idle from the bottom tier up to the OEM. The potential costs associated with these events increase exponentially when supply chain disruptions occur in our modern, globalized world. A factory fire in a Tier 3 supplier in Asia can leave U.S. production vulnerable with unforecasted costs or even grind production to a screeching halt. According to MIT Sloan Management Review, “Most managers know that they should protect their supply chains from serious and costly disruptions — but comparatively few take action.” All efforts to mitigate risk are undermined by the weight of the supply chain’s financial performance. Increased inventory is an obvious fix, but its effectiveness is diminished by higher costs. It is the same with strategies involving onshoring capacity or managing new suppliers. Even if such risk mitigation options offered a more complete solution, a recent case study on Ford Motor Company’s operations revealed that manufacturers don’t understand where they are most vulnerable. Most risk management strategies are focused solely on protecting the portion of the supply chain that produces “strategic components” or the components that differentiate products from competitors and influence consumer decisions.However, supply chain disruptions for a low value part versus a high value one can still have the same effect on shutting down production and pushing delivery dates — time is agnostic to part value. No matter the price of the part — $.02 or $2,000 — a complex assembly cannot be completed, distributed or retailed without it. The question remains, how do you protect yourself and still turn a profit? MakeTime, a virtual machine shop that connects purchasers with machine capacity, offers the only true distributed manufacturing platform. Distributed manufacturing is the flexible risk mitigation solution essential for maintaining a healthy supply chain and avoiding supply chain disruptions. 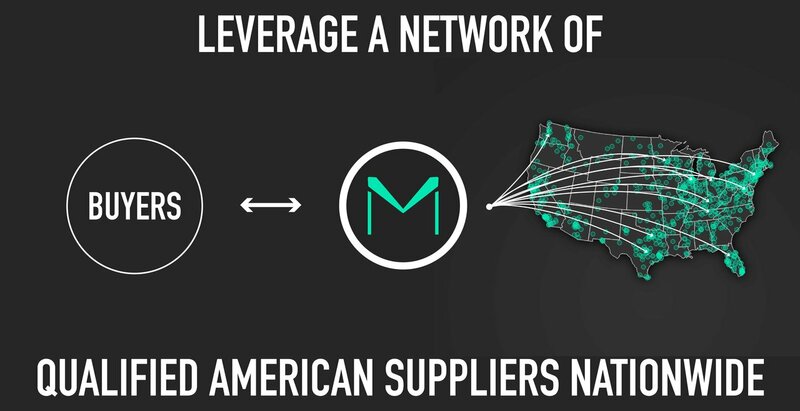 The MakeTime platform relieves the threat of supply chain disruptions with a network of thousands of pre-qualified U.S. suppliers with CNC machine capacity, material distributors, and logistics partners. purchasers on the platform are only required to upload a CAD file to get started and choose their own in-hands date. MakeTime quotes all machining, materials, and logistics costs for approval by the purchaser. Once approved, MakeTime sends the job to the supplier or suppliers best suited to complete the job based on available capacity, capabilities, location, and other factors. The job is not complete until the purchaser has parts in hand that meet quality expectations.